So it looks as if our enfant terrible Dele Alli is going to get away with his crude and rude finger gesture after he had been floored by a dodgy tackle against Slovakia on Monday. His dubious claim that it was aimed at England team-mate Kyle Walker is apparently being supported by the FA before any investigation can start. We who watch him every week with Spurs know he is a golden prospect, but we are always on the edge of our seats incase his temperament tows him into trouble. No matter who the gesture was meant for, it is an appalling example for all the kids who look up to him for his skill and technique. You are better than that, Dele. Somehow Mauricio Pochettino must find a way of retaining the edge of Alli�s game while removing the stupidity. Every time he steps on to the pitch there will be players looking to wind him up. 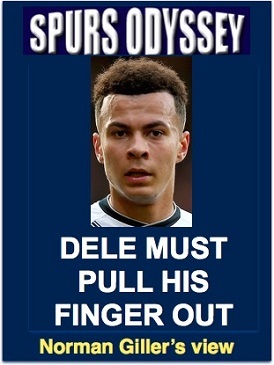 In short, Dele must pull his finger out. Pochettino was a warrior of a player but knew when to walk away from incendiary incidents. Now he must pass his wise-head advice to the stunningly gifted but slightly flawed Alli. The pulling power of Pochettino can be measured by the transfer business Tottenham achieved in a flurry of late deals last week. It was the Poch who was the common denominator in Juan Foyth choosing Spurs over PSG, Colombian defender Davinson Sanchez turning down Barcelona, Spanish striker Fernando Llorente selecting Tottenham over Chelsea and Ivory Coast right-back Serge Aurier preferring the Lilywhites to Juventus and Manchester United. Danny Rose would not have needed to Google to see who they were, particularly 19-year-old Foyth who is rated the best young prospect in Argentine football. He is a central defender, equally at home riding shotgun in midfield. Foyth along with the other newcomers all want to play for Pochettino, whose philosophy of playing with style and a smile has whipped through the soccer world like a forest fire. And come January Ross Barkley is likely to bring his golden boots to Tottenham, because he has come under the Pochettino spell. I understand that the possibility of playing for the Poch was the main reason he did a turn-about on joining Chelsea, along with the fact that he will get more money in his personal kitty as he nears freedom of contract. Thank goodness the Transfer Window is now closed and we can concentrate on footballing matters rather than ill-informed gossip and wild rumour. Spurs were linked with nearly 100 players during the summer, and hardly a single deal proved to be fact. Just imagine how much reading time you have wasted, with the ITKs filling acres of Internet and newspaper space with what Donald Trump would label Fake News. Football is now very much a squad game, and nobody can claim Spurs do not have strength in depth. The substitutes� bench is going to be heaving with rich talent. But it is rarely going to feature Dutch enigma Vincent Janssen who has not been included in Tottenham�s named squad for the Champions League challenge. He turned down a move to Brighton during the transfer window, and is almost certain to be on his bike in January. Now that Harry Kane�s England duties are over he can look forward to having an experienced playmate in the dangerous Llorente, who will surely bring the best out of our Harry. And let�s hope for more of that fabulous finishing from Eric Dier. He can become a menace at corner kicks when positioning himself to meet the deadly accurate deliveries from Christian Eriksen. We still have Danny Rose and Erik Lamela to return after injury, and now the international break is over we can all settle down to getting into the new season, with Everton at Goodison and then Borussia Dortmund at Wembley as true tests of our in-depth strength. May the Foyth be with you � and peace be with Dele Alli. WEEK 4 of the Sports Odyssey Quiz League 2017-18. The rules are simple: I ask one Tottenham-related question for which a right answer earns you two points, and then a related teaser that can bring you an extra point. Who won 97 international caps, played in the 1994 World Cup finals and was an FA Cup winner with Tottenham? Against which team did he help Spurs win an FA Cup quarter-final on his way to Wembley for the final? Answer to question No 3 was Tom �The Thud� Huddlestone, who has rejoined the Derby County club from which affable Martin Jol signed him for Spurs in 2005. First name drawn from the correct answers was Eric Seed, of Rotherhithe, who has followed Spurs since the early 1970s. I will send Eric a screen version of my Spurs �67 book (you might consider buying a signed hardback copy from me at http://www.normangillerbooks.com � all profits to the Tottenham Tribute Trust to help our old heroes).